The Searcher called in with Limits of Yellowfin Tuna (140) for 28 Anglers. The Dolphin PM trip caught 31 Bonito, 18 Rock Fish, 6 Sand Bass, and 5 Calico Bass for 17 anglers. The Bight called in with limits (6) bluefin for his 3 anglers. The Pacific Queen called in with 2 days of limits of yellowfin 12-30 lbs. on their 3 day trip. The Pegasus has Limits of Yellowfin Tuna (90) for 18 anglers. The Pacific Dawn has limits of Yellowfin Tuna (100) and 1 dorado for their 2 day charter for 10 anglers. 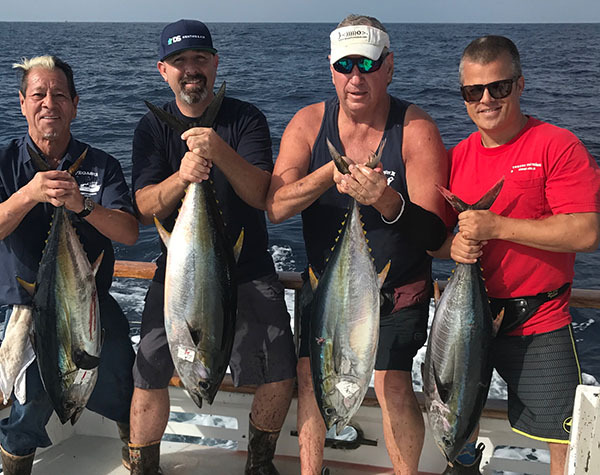 The Liberty called in this AM with LIMITS of Yellowfin Tuna (45) and 10 skip jack for 9 anglers on their Overnight charter and are on the hunt for other species! The Fortune called in this AM with LIMITS of Yellowfin Tuna (100) for 20 anglers and are on the hunt for Dorado! The Condor returned this AM with LIMITS of Yellowfin (90) Tuna for 20 anglers on their 1.5 day trip! If you plan on fishing the Overnight or 1.5 day trips, please bring a 25 or 30 pound outfit for Yellowtail, Yellowfin, Dorado and Bluefin. Also, please bring 40 to 80 pound outfits for the bigger Bluefin. The Flatfalls are working very well (160 to 250 grams). 1/0 to 4/0 circle hooks for live bait.